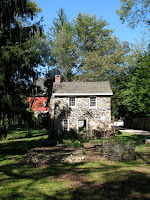 Jersalem Mill, a Quaker village established in 1772, is located in Maryland's Harford County. 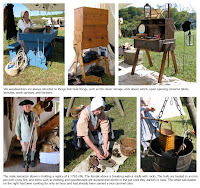 Business partners Isaiah Linton and David Lee set up several grist mills along the Little Gunpowder River in the second half of the 18th-century. 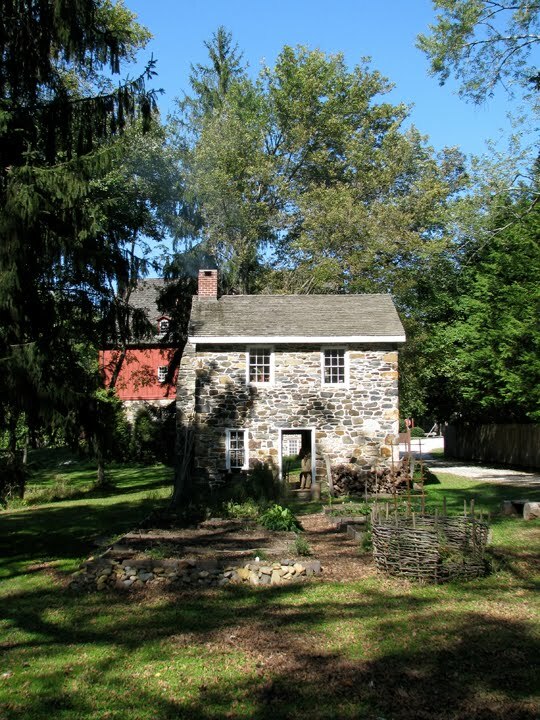 Buildings sprang up over subsequent years to create a village surrounding Jerusalem Mill. 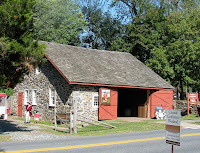 A gun shop, located behind the mill, is believed to have produced muskets for the Maryland militia during the Revolutionary War. In later years, the building was used for coopering, housing, and rental space. The blacksmith shop is across the street from the mill, a general store is just a short walk away, a springhouse is tucked away in a nearby field, and Jericho Covered Bridge is an easy quarter mile walk down the road. A few other buildings in the restored village are privately owned and are not open to the public. 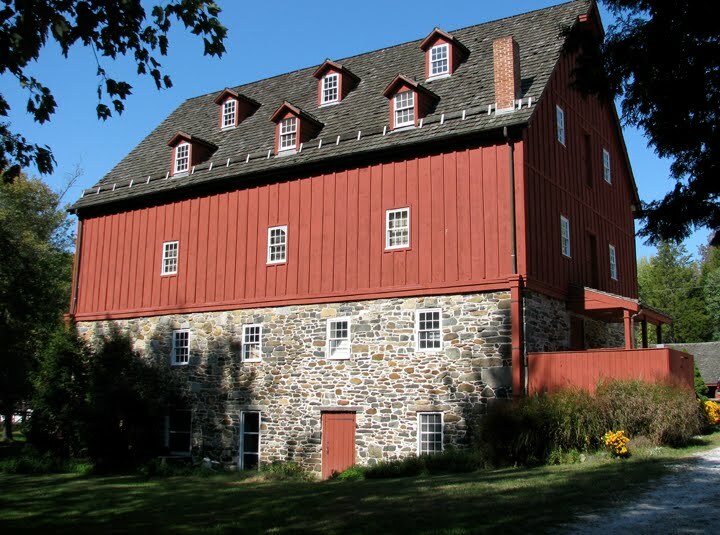 The mill ceased operations in 1961 when the property was purchased by the state of Maryland. 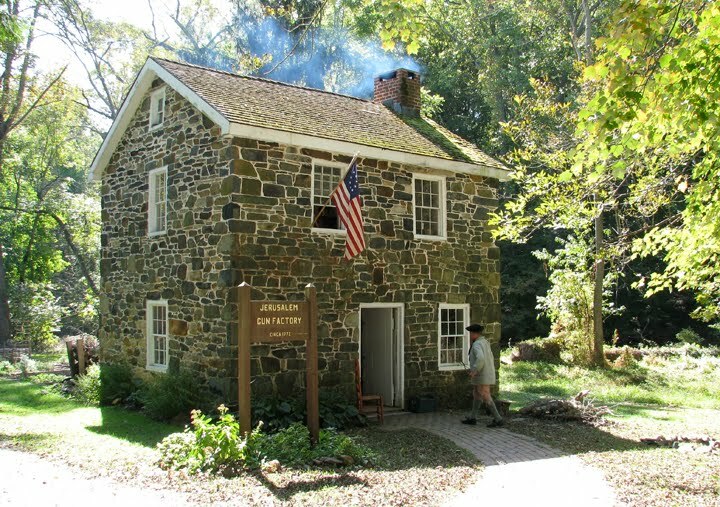 It then became part of Gunpowder Falls State Park. Extensive renovations to the mill, gunshop, and blacksmith shop, all of which had fallen into disrepair, brought them back to life. We visited the village on Colonial Craftsmen Weekend, where reenactors pitched tents, demonstrated traditional crafts, and sold handmade products. I learned that walnut hulls cooked in water create a natural stain. Yellow is th e easiest color to achieve with natural ingredients and green is the most difficult. When making lye soap, the consistency is correct when an egg will float with just a quarter size section of its shell showing above the liquid. And I learned that wax must be cooked at just the right temperature—not too hot and not too cool—in order for it to adhere to the string that's dipped into it to form a candle. 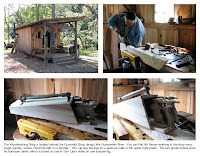 The two men who were working in the woodshop were very friendly and were happy to talk with another woodworker. 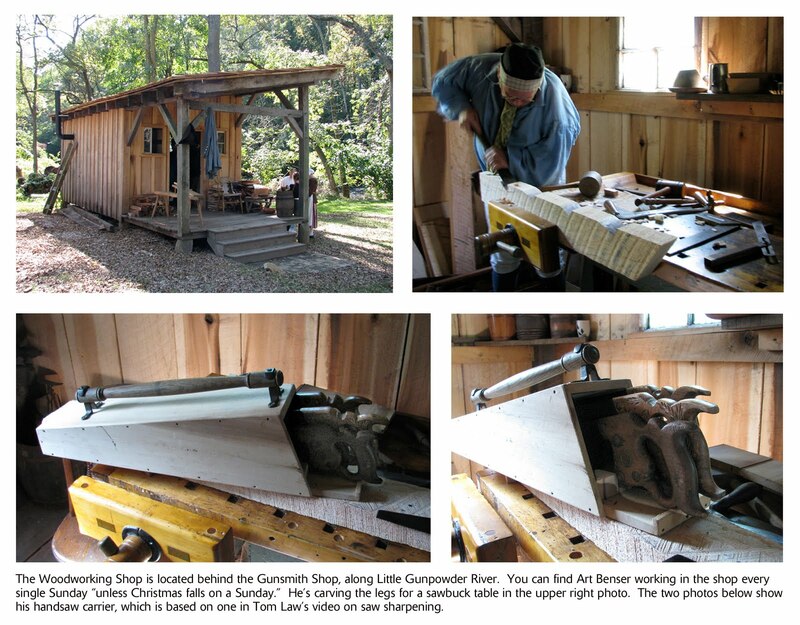 If you plan to visit, you can find Art Benser, the master woodworker, in the shop every Sunday, unless Christmas falls on that day.